UPDATE 3/31/13: Now a super easy way to install. Just install the CommCenter Patch and the LTE enable from out repo. This will be a better solution for people who want to enable LTE on their unlocked iPhone 5. Not only does it save people the time and hassle of having to go into the iPhone’s system files, but it also creates an automatic backup of the original carrier.plist should the choose to revert. 4. Once the URL is entered in tap “Add Source” and allow for it to download all of the repo’s info and packages. 6. Once you have found it, install it and then reboot your iPhone once completed. 7. After the iPhone has restarted, open Cydia once again. 10. Once the URL is entered in tap “Add Source” and allow for it to download all of the repo’s info and packages. 12. Once you have found it, install it and then reboot your iPhone once completed. Update 3/28/13 Part III: Updated the main file to fix a calling issue as people were still reporting it. ISR for LTE wasn’t enabled. The Phone, rather than connecting to the strongest signal for voice, remains connected to the LTE tower during calls and reduces call quality. The latest fix enables ISR. Just follow the instructions below the red text to install the latest version. Update 3/28/13 Part II: Everyone Just follow the original instructions below the red text to install the new files over the previous ones. There should now be 4 files instead of 3. We added a carrier.pri file. Users have reported bad calling quality, inability to make/receive calls, and downgrading to 4G HSPA+ while on a phone call. We did take note of the issue and took a close look at the LTE coding. VoLTE (Voice over LTE) was enabled by mistake but has been fixed in this updated version. Please follow the below instructions to fix this issue. If you have any other concerns or problems please leave a comment below. 2. Tap “Open in iFile” and once in iFile tap “Unarchiver”. A new version of the “Overrides_N41_N42.pri” will appear. 4. Now tap “done” at the top and tap the house icon at the bottom then tap “Library”, then tap “Carrier Bundle.bundle” (the one with blue text), and then tap edit at the top again and tap the clipboard icon. Tap “paste” and it will auto inject the updated carrier file into the carrier folder. Be sure to chose the overwrite option. 5. After this has been done, exit iFile and reboot your iPhone. That’s it! Did this fix your issue? Please let us know below in the comments section. So you purchased an unlocked iPhone 5 before T-Mobile released their new version of the iPhone 5 that supports 1700mhz. This could be the AT&T model or the officially unlocked version sold by Apple. 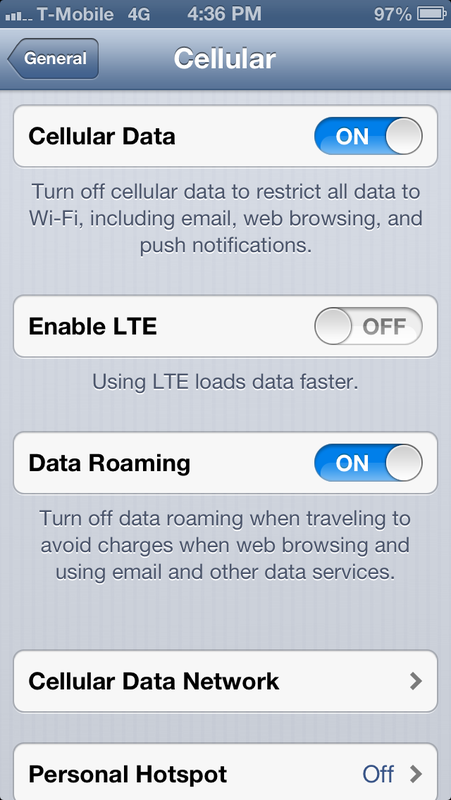 Please understand that if you have a Verizon iPhone 5 you will not be able to connect to T-Mobile’s LTE network. It does not have the correct LTE band. Currently T-Mobile only has a few cities listed that have support for LTE and they are upgrading towers all year long. Now that you have an unlocked AT&T model A1428 or an officially unlocked model A1428 you can proceed to follow the instructions below to load a custom carrier file onto your iPhone and enable LTE. This will only work on A1428 model iPhone 5’s. This is the guide to enabling LTE on your iPhone 5 model A1428 for T-Mobile. 8. Search for iFile. The free version includes basic features. You will want to purchase it to take advantage of all of the features. 9. Once you have found it, install it. No reboot is required, though you can do it just to be on the safe side. Here is a link to the original file in case you run into any issues. Download the original carrier file here. replace carrier.plist with the file you just downloaded. You also need to delete any overrides_N41_N42 files and the new carrier.pri included in the Release 2 bundle that were placed in the Unknown.bundle carrier bundle. If you run into any problems please leave a comment below. A rare issue that happens is that is doesn’t work while the apn settings tab disappears. A simple fix to this is to go into var/mobile/Library/Carrier Bundles/overlay and delete any and all files in that folder and then restarting the phone 2 times. The first reboot you need to let it acquire signal. It will take awhile but will eventually acquire it. After the signal is found it will say T-Mobile 3G and then this will be where the 2nd reboot must be done. After the 2nd reboot it will acquire signal faster this time and display T-Mobile 4G. Once you see the 4G icon that’s when you know it has worked. But this is a rare occurrence but should be a disclaimer and this fix should be available to the people that install it. Installed “T-Mobile USA Carrier Bundle” from the leimobile repo. Automatically installed the commscenter too upon reboot. Picks up T-Mobile “4G” but I’m pretty sure it’s my 3G, just rebranded. Carrier bundle just changed around my APN settings. You are picking up HSPA+ and it is now properly showing it as “4G” rather than the incorrect “3G”. You will not get LTE on your device. I have a question/request for LEi Mobile. Can they do this hack for Simple Mobile? They use T-Mobile’s network. After installing “T-Mobile USA Carrier Bundle” for A1429 (t-mobile) it shows 4G but my personal hotspot is still unavailable. Any suggestions ? Does anybody figured out how to fix hotspot problem??? Call T-Mobile to have them add it or download tetherme from Cydia. I installed this last week before you started on the “automated path”. The T-Mobile Service is bad by me so I am trying to roll back to AT&T I copied the Original files you have here back and deleted any overrides_N41_N42 files and the new carrier.pri included in the Release 2 bundle that were placed in the Unknown.bundle carrier bundle. restarted and lost the carrier Blue bundle and now have no data. How do I fix this as I don’t want to do a restore, want to keep my jailbreak? I am a reader of this blog, first there are many bundle for difference carriers, when you insert T-mobile SIM card, it will jump to unknown bundle, if you insert AT&T SIM card, it will jump to att_us.bundle, after the installation of this patch, it will not involve what SIM card you insert. But if you insert ATT sim card and delete the overrides_N41_N42.plist, and overrides_N41_N42.pri etc… You are deleting the att_us.bundle inside files. The correct restore bundle should be unknown bundle. I think, if I understand what you are saying is that after this patch it doesn’t matter what sim you use? Now I tried the “restore” and both sims don’t work. I have tried countless restarts but still don’t have data services. Do you restore to 6.1.3? Because you cannot restore back to 6.1.2 after jailbroken. If you are restoring 6.1.3, can you try to DFU mode first and restore again? If you still are 6.1.2, then you can wait the author to reply you. I did not restore, I am still at 6.1.2 and would like to keep it that way. I appreciate you trying on this. Yeah I am going to wait on the author, I am working from home today so data isn’t an issue. Hopefully I can get this fixed by tomorrow, out in the field on Saturday. It has worked on my factory unlocked phone but it may work too well. Even if I disable LTE the phone will sometimes still show 4G on the status bar and will still connect at 4G speed. Other times it will show E on the status bar indicating it is connected using Edge however the phone seems to continue operating at 4G speed. That’s because you are getting HSPA+ rather than LTE. The reframed areas are 21 Mbps 4G. Does anyone know what happens if you move out of LTE coverage zones? Do you switch back to 2G/Edge if your area has not been refarmed? Yes, you will shirt down to EDGE in non reframed zones and 4G HSPA+ in reframed zones. I followed the directions and am getting LTE signal. Safari works fine, but when I open Facebook app everything loads but the pics. Instagram will not load anything, and the App store will not load either. The Speedtest app will not work either. Is anyone else having this problem. All the apps work fine on wi-fi, but LTE wont load anything but webpages.I deleted and re-downloaded these apps and they still wont work on LTE. and on my friends phone it has no patch but the apn is set to epc.tmobile.com…. I tried sending her a MMS but no picture will show up? but when I send it to someone else with AT&T the get the picture? I guess the file is TMobile LTE Package release but where do you find this file on your iPhone? If this file is not yet on your phone after installing iFile, how do you download it? Thanks for clarifying this step. Haven’t heard back from you yet could really your help roll back to AT&T. Please send me the files. Hey Bill. Send me a message to my inbox at joeybrown1104@yahoo.com and I will send the AT&T carrier bundle to you. I am in San Francisco, I have tried simple mobile. 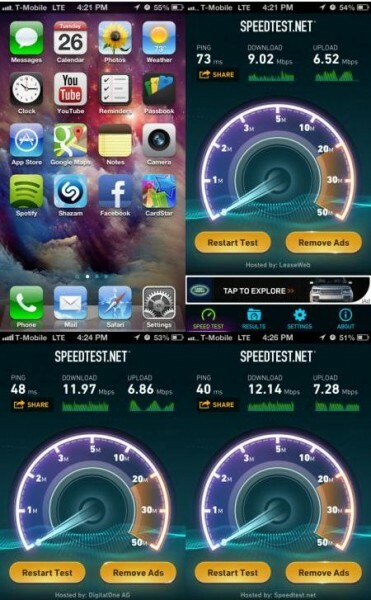 Ok, first, LTE depend on which city has LTE. I think SF still has no LTE, it will show 4G icon. I feel that speed is the same as 3G icon when non-modified. Actually it doesn’t matter for the speed of 4G or LTE. The big problem is that when 3G/4G not available, it will connect EDGE. The EDGE turning is super slow. Even if you get success with 4G or LTE. If you are in non-4G area, your head will like a bomb. The problem should be 1900mhz and 1700mhz. Even if you can connect 2100mhz or 1900mhz, T-mobile is upgrading 1900mhz to 3G/4G network but there are a lot of place where can’t receive 4G, then band will go to 1900mhz Edge. Finally, this tweak is very good but it doesn’t mean useful because iPhone will also get the edge speed when 4G not available. If author can make the frequency from 1900mhz to 1700mhz. It is the only way. I am also in an area that does support 4G data with a consistent 10+Mbps speed but the only way to hold the 4G data is to manually select Tmobile and I can only keep data for about 30-45 minutes and then its just edge. I would think that the towers just aren’t strong enough but then in areas nearby that barely do 4-7 Mbps automatically enable the data. My question is why my iPhone can’t keep a consistent connection where data is much stronger. When I in Manhattan, I could see 4G but still get Edge speed.. I used to get 3G in Manhattan before this hack.. Does it mean the hack doesn’t work? WORKS!! Thanks a lot guys. Just follow all of the updated instructions and it’ll work. Right now, I only get 4G (HSPA+ I think, it’s pretty fast) because T-Mobile hasn’t fully switched to LTE yet. At the end of May, everything will be fully LTE, but it’s all good now. Only con is, when it can’t get 4G, it goes down to ‘E’ (EDGE, I think) which is horribly slow, hopefully there’s another tweak to make fall to 3G/2G? Let me know, thanks again. Hey how’s it going? First off I absolutely love this LTE hack for T-Mobile. It’s awesome that you were able to do this before they released their carrier update which brings me to question. I’m sure it’s possible but would you be willing to do this hack but for Simple Mobile? Seeing how they’re a T-Mobile MVNO offering $50 for unlimited everything including 4G data this LTE hack would be golden. I know a lot of people I could convince to switch from the slow Sprint, expensive Verizon and just awful AT&T for $50 unlimited LTE. So please can you make this hack applicable to Simple Mobile? Thank you for your time. Hey how’s it going? First off I absolutely love this LTE hack for T-Mobile. It’s awesome that you were able to do this before they released their carrier update which brings me to question. I’m sure it’s possible but would you be willing to do this hack but for Simple Mobile? Seeing how they’re a T-Mobile MVNO offering $50 for unlimited everything including 4G data this LTE hack would be golden. I know a lot of people I could convince to switch from the slow Sprint, expensive Verizon and just awful AT&T for $50 unlimited LTE. So please can you make this hack applicable to Simple Mobile? Thank you for your time. Hey how’s it going? First off I absolutely love this LTE hack for T-Mobile. It’s awesome that you were able to do this before they released their carrier update which brings me to question. I’m sure it’s possible but would you be willing to do this hack but for Simple Mobile? Hey how’s it going? I am having an issue posting my comment but I have a request/question so would it be possible to communicate through email? hi, i have followed all steps for changing the n_42 files but it looks like i have lost the internet speed totally. can someone help for get the orginal files back plase. Sorry, how do I download Cydia… is that an app? It is an app you get once you have jail broken your device. I have the factory unlocked iPhone 5, and am using T-Mobile, but whenever I am in an LTE area, I have absolutely no internet connection. I was hoping your instructions would help fix this problem. I guess I have to figure out how to jailbreak my phone now. 1. Plug your iPhone 5 into iTunes and backup the device so you won’t lose anything, just in case. 2. In the device itself, tap the “Settings” app and navigate to General >Reset > Erase All Content and Settings. 3. Once you have done that, the iPhone will auto reboot. 5. Once downloaded, your iPhone will boot up into iTunes. Before you do anything, make sure to decline any and all prompts to update carrier settings. Now, you’ll to go ahead and enable iTunes to except custom carrier bundles, if it’s not already. 8. After this has successfully been entered in, click on the tab for your iPhone 5 and click “Update” or “Check For Update” while holding down the Alt/Option key for Mac users and the Shift key for Windows users. Navigate to where you downloaded the hacked carrier update file, which will be named “TMobile_US_iPhone_Hack.ipcc” then select it and click Open. 9. The carrier update should now successfully be installed. Now, go back into the “Settings” app and navigate to General > Cellular > Cellular Data Network and change all APNs to epc.tmobile.com, even the LTE (Optional) setting. Once done, restart your iPhone one last time for the changes to take effect. 10. If you encounter any problems or wish to revert back just download the file below and repeat the above steps only with the default carrier file instead. I’m trying to use this last solution on other carrier (Antel Uruguay), with no luck (can’t even see LTE enable switch). LTE provided service un Uruguay is Band 4 (AWS). Can you provide some help? This method only works in T-Mobile USA. Apple only gives the option to turn of LTE in your cellular settings. After the update I’m only getting H+ service any suggestions or solutions would be welcome! After the update I’m only getting H+ service any suggestions or solutions would be welcome. sing Hip Store repo you can add any Paid apps and themes for FREE on your Cydia enabled iDevice..!!! tested tto see if it can survive a forty foot drop, just so she cann be a youtube sensation. views. I know this is completely off topic but I had to share itt with someone! you knew of any widgets I could add to my blog that automaticaly tweet my newedst twitter updates. Please let me knokw if you run into anything. I truly enjoy reading your blog and I look forward to your new updates. You ought to expend authentic effort and time into your Fb promoting. months to be able to attakn access on the brand neew Timeline.